The Global Volcanism Program has no activity reports for Lautaro. The Global Volcanism Program has no Weekly Reports available for Lautaro. The Global Volcanism Program has no Bulletin Reports available for Lautaro. The Global Volcanism Program has no synonyms or subfeatures listed for Lautaro. Lautaro is the northernmost volcano of the Austral Volcanic Zone (AVZ) in the southernmost Chilean Andes, and is the closest volcano to the Chile Triple Junction plate boundary. Volcanoes of the AVZ originated from subduction of the Antarctic plate beneath the South American plate. The Catalog of Active Volcanoes of the World synonyms for Lautaro (Cerro Pirámide, Chalten, and Chaltel) are actually synonyms of the dramatic Patagonian granitic peak of Cerro Fitz Roy (Moreno 1985, pers. comm.). Glacier-covered and rising above the Southern Patagonian Ice Field, this dominantly dacitic volcano has a crater just below its summit on the NW side and a 1-km-wide crater on the NE flank. Ash deposits from eruptions were visible on aerial photos taken during several occasions during the 20th century, and older ash layers form prominent markers on outflow glaciers of the Patagonian icecap. Lliboutry L, 1999. Glaciers of the Wet Andes. In: Williams R J Jr, Ferringo J G (eds) Glaciers of South America, U S Geol Surv Prof Pap, 1386-I: 148-206. Motoki A, Orihashi Y, Naranjo J A, Hirata D, Scvarca P, Anma R, 2006. Geologic reconnaissance of Lautaro volcano, Chilean Patagonia. Rev Geol Chile, 33: 177-187. Shipton E, 1960. Volcanic activity on the Patagonian ice cap. Geog Jour, 126: 389-396. There is no Deformation History data available for Lautaro. There is no Emissions History data available for Lautaro. 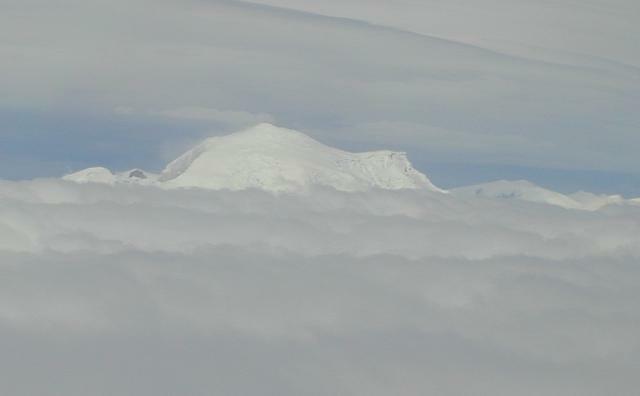 The northern side of Lautaro volcano rises above a sea of clouds. A 300-km gap occurs between Cerro Hudson and Lautaro, the northernmost of five volcanoes comprising the australandean volcanic zone of the southernmost Chilean Andes. Glacier-covered, 3607-m-high Lautaro volcano, the highest Chilean volcano below 40 degrees south, has a crater just below its summit on the NW side, and a 1-km-wide crater is located on the NE flank. Photo by José Naranjo, 2002 (Servico Nacional de Geologica y Mineria). There are no samples for Lautaro in the Smithsonian's NMNH Department of Mineral Sciences Rock and Ore collection. Large Eruptions of Lautaro Information about large Quaternary eruptions (VEI >= 4) is cataloged in the Large Magnitude Explosive Volcanic Eruptions (LaMEVE) database of the Volcano Global Risk Identification and Analysis Project (VOGRIPA).